Karen Millen Scalloped Off The Shoulder Bardot Embroidered Top Size 14. Condition is Used. Dispatched with Royal Mail 1st Class. Karen Millen. Tie Bow Neck Black Drape Soft Long Sleeve Blouse Shirt Top. Button front with Collar. 31”Chest & 24.5”Length. Dry clean only. Made in China. Karen Millen White Blouse. BNWT - RRP £110. Size 12, Bust 36". Machine washable. Overall length 24". Karen Millen Black Blouse Shirt Top Size 10 Bnwt Rrp 99.00. 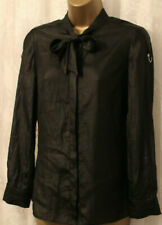 KAREN MILLEN jet black Sheer Blouse With Silk Size UK 10. lovely top paid 65.00 in sale. LOVELY COSY TOP WITH SOFT JERSEY FEEL TO IT AND VELVET FRONT PANEL. ZIP ON BACK. IN IMMACULATE CONDITION. By KAREN MILLEN. Grey striped satin stretch fit jacket shirt top size XS. B This is a Gorgeous. Collared neckline with pull ties either side. Two front side chest pockets which are popper fastened. EXQUISITE KAREN MILLEN BLACK & GREY SPOTTED PRINT LADIES TOP / BLOUSE WITH BEADED FRONT POCKET AND CONTRASTED BACK. SIZE 16 UK, SHORT SLEEVES, BEAUTIFUL ‘SEE THROUGH’ SHEER MATERIAL. PRISTINE CONDITION. PRETTY KAREN MILLEN SHIRT. This Karen Millen sheer sleeveless blouse has a distinctive black and white design. Length from shoulder to hem 25" (63 cm). UK size 6 (EU 34). Bust 30" (76 cm). Karen Millen Lace Broderie Anglaise Ivory Sheer Top Blouse T Shirt Tunic 6/8Uk. KAREN MILLEN - Off white/ cream embroidered blouse. Karen Millen Multicolour / White Sleeveless Top Size 6. Condition is Used. Dispatched with Royal Mail 2nd Class. A black tunic top by Karen Millen. Removable long sash belt and is fully lined in a contrasting fabric.